In this work, block copolymers of butyl acrylate and glycidyl methacrylate (GMA) having molecular weights 10,000 Da were synthesized with varied GMA block lengths by 10%, 20%, and 30% using atom transfer radical polymerization. The synthesized copolymers were further reacted with tetraaniline to formulate conductive polyol and further characterized by mass spectroscopy, UV–visible spectroscopy, 1HNMR, and FTIR. The block copolymers formed were evaluated by gel permeation chromatography, Fourier transform infrared spectroscopy (FTIR), differential scanning calorimetry, and nuclear magnetic resonance (NMR) techniques for structural elucidation. These polyols were formed with 10, 20, and 30 wt% with isocyanate (HDI N-3300) to form a polyurethane. 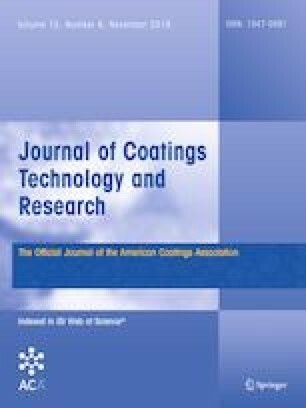 The effect of concentration of conducting polyol on anticorrosive coating performance properties, namely mechanical and optical properties, was further studied. The anticorrosive performance was evaluated by salt spray test and electrochemical impedance spectroscopy.